You will find this new brown lens far more flattering to wear . . . more pleasing to look through. This is the finest sun glass ever made by American Optical. Because of its superior qualities, the Air Force uses this lens for aviation glasses. Now you may have it — exclusively in the smart AO COSMETAN-Calobar models. For women, frames in Natural Waffle, gay new Pink Crunch . . . For men, handsome Metallic Copper . . .
From 1952, an illustration for Cosmetan Calobar sunglasses, and of why things were so much better back in the Olden Days. ≈ When You Meet an Oldsmobile Owner . . .
. . . You Meet a Friend of Oldsmobile. The high regard Oldsmobile owners have for their cars is significant of the deep and enduring satisfaction this fine car of low price gives in daily use. In the past few weeks alone, hundreds of owners have written to Olds Motor Works, voluntarily expressing their enthusiastic praise for Oldsmobile . . .
From the depths of the Depression in 1931, a Packard of imposing proportions. Let’s say you really, really, really wanted a red Coupe de Ville but Hubby gifted you with a black Packard sedan instead. What would your reaction be? Probably something like this lady’s. Then again maybe she just needs more fiber in her diet. Traditionally, the highest esteem of the motoring public, as reflected by “Ask the man who owns one,” is the priceless heritage of Packard. To enrich this heritage, the vast engineering and manufacturing facilities of the Packard organization are dedicated to the development and production of the New Packards for 1955. These fine cars are presented to you in that light, proudly and confidently . . .
It’s not that hard to detect a whiff of whistling-past-the-graveyard in the opening lines of the Packard brochure for 1955, the make’s next to last year as a full-size car before it turned into a thinly disguised Studebaker. From the sales catalog, one two three views. The cover showed the three-tone color scheme of the Caribbean convertible. Tomorrow’s advanced engineering meets yesterday’s finest traditions of careful craftsmanship in the brilliant new 1953 Patrician . . .
Here’s the newest thing in motor trucks . . . new GMCs in the light and medium duty range. They’re Better Looking because of striking new rugged radiator design . . . because of smoothly blended streamline styling of hood, fenders and cab . . . This illustration for GMC Trucks from 1947 has the storybook quality characteristic of the era that we find very appealing. You almost expect Curious George to be at the wheel. And the fellow riding shotgun should be one of Syd Hoff’s stubbly galoots. Here in Pontiac’s Bonneville Sport Coupe and Convertible, a phenomenon is proved: high-performance road cars have invaded the realm of fine cars, and with a luxury and elegance all their own. Their beauty is a dynamic thing — but their real significance lies in the way they make luxury motoring an exhilarating sport again. The 1958 Pontiac Bonneville, a baroque barouche whose stylized rocket appliques trailed chrome exhaust along the rear fenders, shared its underpinnings with the Chevrolet, a design that lasted for just one year instead of the usual two or three. The twin jet-tube taillights reappeared on the 1960 models. 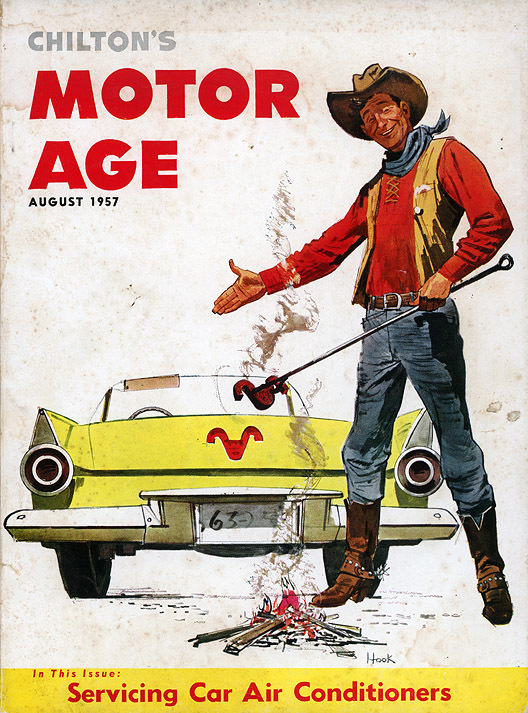 For decades, Motor Age had its covers illustrated with Saturday Evening Post-style artwork. 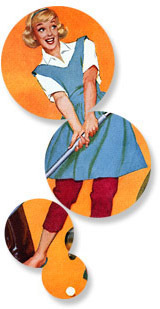 One of the final examples before MA switched to stylized graphics along the lines of Fortune magazine in 1958 is the cowpoke below. Inside we found a couple of keepers, among them this ad for a Snap-On Tools oscilloscope with a rather unfortunate name. Also an intriguing glimpse of the “Edsel mobile training unit” — a dozen air-conditioned travel trailers with “Edsel Service Laboratory” on the sides. From 1947, a rendering of “Tomorrow’s Power Shovel” for Bohn Aluminum & Brass. You’re smart about keeping foods fresher . . . YOU just wrap them in waxed paper! You can be equally smart in buying bread by choosing the loaf wrapped in waxed paper. And waxed paper stands up best after you bring your bread home, too. Yes, for keeping bread fresher, longer, there’s just nothing like waxed paper. When it came to food packaging in 1954, cellophane was on the march. But paper wasn’t about to take it lying down. Hence this full-page ad from the Waxed Paper Merchandising Council. 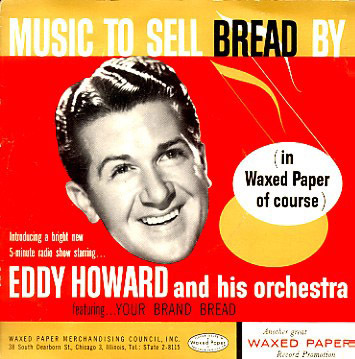 Which also put out a record, “Music to Sell Bread By.” Gloves by Merry Hull. 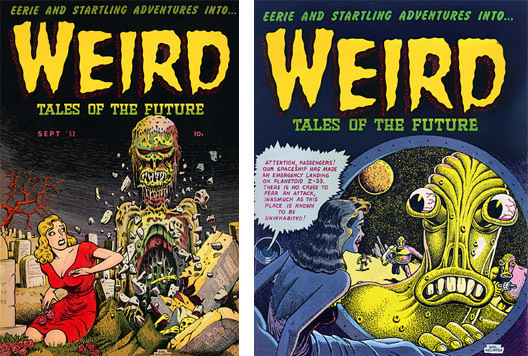 From 1952, two comic book covers by artist Basil Wolverton, who went on to bigger things at Mad magazine and, later in life, illustrated a series of Bible stories for children. Ten cents apiece in 1952, these set us back a total of 650 bucks! And who do we do this for? Yes, you. And you and you. Help us make it back in the Print Shoppe. Thanks to you (and you, and you), people are starting to hear about Plan59, and read about us, too. 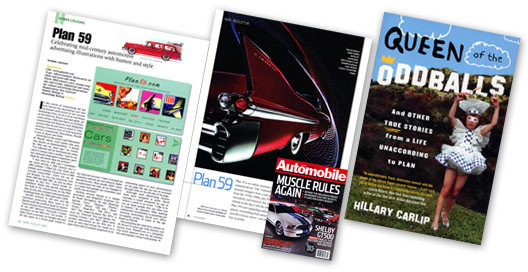 We’re profiled in the July issue of Automobile magazine, where we have the whole back page to ourselves as this month’s “Non Sequitur” feature (Latin for “doesn’t follow,” which along with “Cogito Ergo Zoom” — I think, therefore I drive really fast — makes Automobile probably the only car mag in history to use Latin puns.) We also get own own page in the August issue of Hemmings Motor News, with a nice article by Mark McCourt. And last but not least, the little girl with the spoon, late of our Photos section, was snapped up by HarperCollins for “Queen of the Oddballs,” Hillary Carlip’s memoir of growing up in Hollywood. Ford’s the car that looked so good it was driven around the world to prove its stamina and performance — the most rugged pre-announcement road test ever given an automobile. To try the road-ruling magic of brand-new suspensions, Ford engineers looked for the world’s toughest terrain. And they came up with the wicked back roads of bump-infested Afghanistan . . . the rutted bed of the Khyber Pass . . . the twisting cattle trails of Cambodia. How do you test for beauty? Ford’s ’58 Styling was exposed to the public’s critical gaze from London to Saigon . . . to the sharp eyes of fashion experts in Paris — style capital of the world . . . There is a world of difference in the styling of these 1960 Fords. New hood contours are gracefully sloping to let you see better what’s ahead. The Thunderbird-inspired roof protects you from broiling sun. This is practical styling combined with fine-car elegance. For the man of action, there are “hot and easy” new Thunderbird Special V-8’s that blend blazing power with kid-glove smoothness. From any Point of View . . . from every Point of Value . . . truly these are the Finest Fords of a Lifetime! 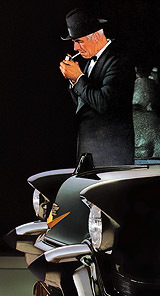 The 1960 model year, with its gull-wing fenders and novel rooflines, marked the beginning of the end for the futuristic styling themes of the tailfin era as sales resistance to constant change began to set in, and car buyers opted en masse for the simpler designs of the Falcon, Rambler and Volkswagen. For 1961 Ford returned to a more traditional, sedate look, leaving cars like this Galaxie hardtop as reminders of what could have been, as opposed to the padded vinyl roofs, opera lamps and fake wire wheels we eventually got. Here’s a brand-new edition of the best-selling convertible of all time — the Ford Sunliner! Its sun-loving, fun-loving new proportions are a beauty to behold. And there’s lively power to match the Sunliner’s breezy looks. Most are equipped with the Thunderbird 352 Special V-8, the very same engine that propels the mighty Thunderbird itself. Hills surrender on sight! The 1960 Ford Sunliner in Montecarlo Red with Thunderbird V8, merging onto the Isadora Duncan Memorial Parkway. Careful! 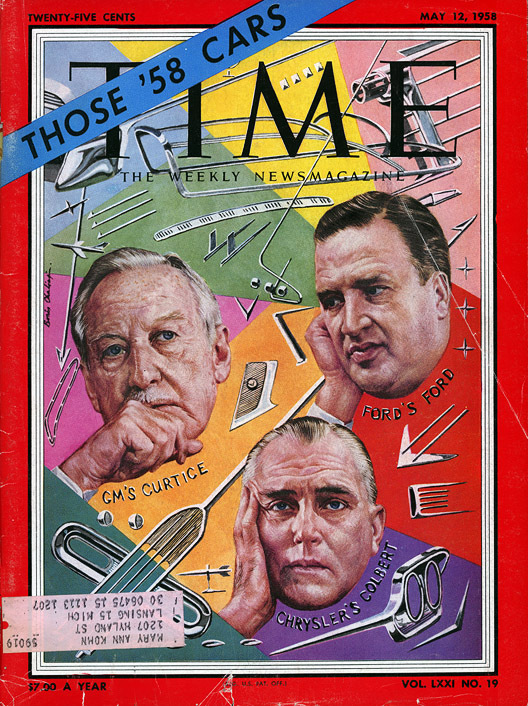 Time magazine’s inquiry into a poor sales year for Detroit had a cover illustration by Boris Chaliapin (son of the noted opera singer) featuring the literal heads of the Big Three and the chrome bones of their cars. So far we’ve identified trim for Ford, Edsel, Lincoln, Pontiac, Oldsmobile, Buick and (to the left of Ford’s forehead) Chevrolet. ≈ Every Inch a Classic! And 213 inches over-all! It’s long on looks — nearly eighteen feet of modern classic styling. It’s a dream for riding comfort — thanks to the new longer wheelbase that floats you over choppy roads. It’s a rocket for performance! 160 horsepower “Rocket” Engine with new Oldsmobile Hydra-Matic Super Drive. Parking? That’s a breeze with nearly 80% of the steering effort supplied by GM Hydraulic Steering! It’s a Classic . . . the fabulous Ninety-Eight featuring Oldsmobile’s latest contribution to supreme comfort: Custom-Lounge Cushions. It’s yours to try — now! We’re not at liberty to reveal our sources, but we’ve just come into possession of a rare photograph of the Taepodong-2 ballistic missile recently launched by North Korea that fell into the ocean less than a minute after liftoff. Intelligence analysts believe the spy shot shows the country’s reclusive “Dear Leader,” Kim Jong-il, personally inspecting the rocket before its ill-fated launch. Wonder what went wrong? “Dual-Tone” goes far beyond mere coloring. It is a completely new and entirely different feature — “built-in” — which blends cab, cowl, hood and radiator grille into one harmonious color design. Available in twelve options. General Motors Truck & Coach Division — Yellow Truck & Coach Manufacturing Company, Pontiac, Michigan. An illustration from 1937, around the time that GM’s first automatic transmissions (later called Hydra-Matic) went into service on city buses made by Yellow Truck. Join us for a ride — the smoothest and quietest you ever tried — in a new 1960 Oldsmobile. We’d like to show you what we mean by Rocket action, Wide-Stance stability, Guard-Beam Frame solidness, foam-cushioned comfort . 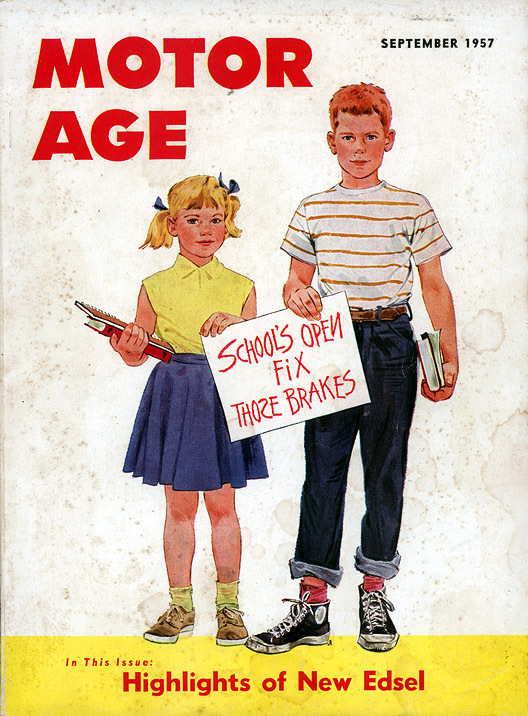 . .
Was (and is) a magazine written for mechanics, service managers, gas station owners etc. Over the next few days we’ll be posting some vintage MA graphics, starting with the one below. The cleaned-up (and somehow not as interesting) version is here. Somewhere in suburbia, circa 1957. Place: The patio. Crime: Arson in the third degree. Perp: Dad. The victims started out so plump, juicy, full of promise (forensic reconstruction shows legs, thighs, breasts). Then things headed south. Fast. There was smoke. Someone grabbed a camera. Happy Fourth, everyone.